On trial in 1917, Alexander Berkman challenged the court: "Are you going to suppress free speech and liberty in this country, and still pretend that you love liberty so much that you will fight for it five thousand miles away?" "Red Emma" Goldman turns out to be a misnomer. 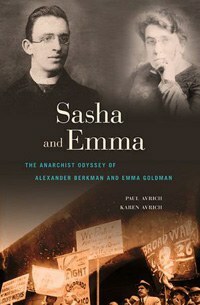 She and her companion and one-time lover "Sasha", born Alexander Berkman, shared a defiant commitment to anarchism. Deported to newly Soviet Russia after the newly imposed Espionage Act expelled the pair from a WWI America resenting their revolutionary calls for no government and voluntary cooperation, within weeks they resented their return to their homeland. Exiled, one came back for only three weeks years later and the other never did. They both died in the South of France, four years apart, as again war loomed. So, if neither Berkman nor Goldman were communists, how did anarchism infuse their lives? Paul Avrich, a professor of Russian History and Anarchism at Queens College, C.U.N.Y., spent his career interviewing those who knew the pair. His daughter, Karen, completes his project and their joint effort in this dual biography pays tribute to the odyssey of this compelling, angry, idealistic pair, fittingly. The Avriches fluently transcribe the memories of many who shared their recollections with Paul in the '70s. As I read this, I found myself intrigued by how deeply anarchists a century ago had entered into their own Occupy Movement, from Puget Sound communities where my father-in-law grew up and less surprisingly the Lower East Side neighborhood where I would stay next month, to a few miles away from my house, where the first Los Angeles Times building was blown up during a pro-union dispute in 1910. That location lent itself to over a half-dozen causes célèbres infusing these 400 pages of text with places and names still resonating today, for a few radicals. The Haymarket affair, the Homestead strike, the Frick shooting, the Ludlow massacre, the McNamara brothers, the Mooney-Billings trial, Sacco and Vanzetti, the Spanish Civil War: at the heart of all these, the energy of Sasha and Emma--and their compatriots who denied the legitimacy of any organization, as Autonomist anarchists dismissing leaders themselves--pulsed. Their outrage at what radicals objected to as violence within the capitalist system and coercive legislation by political tyrants and financial tycoons rankled. Autonomists coalesced internationally after innocent anarchists were sentenced to death for the Haymarket incident. In 1886, a bomb went off as police broke up a peaceful Chicago meeting of those opposed to police brutality. Autonomists (unlike most anarchists) rationalized their violent reaction to such repression by Capital and its political representatives as infinitesimal compared to the death count of millions of lives lost under authority and the state. That Haymarket incident indirectly set this saga in motion. Immigrating to New York, at the age of 16 for Emma and 18 for Sasha, the Russian pair met a year after Sasha's arrival to Manhattan, in 1889 at a leftist café. The Jewish but atheist couple bonded over a common upbringing in Kovno; both had uncles who were anti-tsarist violent radicals, Nihilists. A tempestuous relationship began; never a romantic couple for long, one cannot say they did not practice free love vigorously. Modska Aronston, Sasha's cousin, formed therefore an enduring ménage à trois. They connected in their common hatred of capitalism, and their united commitment to Autonomists, fueled by the Haymarket incident. In 1892, they had an opportunity to act on their convictions. When manager Henry Clay Frick refused to give in to striking steel workers in Homestead, Pennsylvania, a siege of the giant mill resulted. Strikers battled the despised Pinkerton security guards, with fatalities on both sides. Locked out for five months, the union members and their families dug in, but had to give in to massive force. The union entirely broken by the corporation run by Andrew Carnegie, to drive home the magnate's refusal never to negotiate, his chairman of the board Frick won the battle. But he lost a war with radicals. A plot for revenge slowly formed in Pittsburgh. Emma tried to raise funds from a night streetwalking. A kindly gentleman took pity on her hapless attempt, and paid her upfront to go home. Partially financed by this strategem, Sasha bought a grey suit, calling cards with the name of a respectable employment agency, and a cheap '38 revolver. He gained entry to Frick's office. Two bullets met their mark; three stab wounds in the struggle that followed plunged deep. Berkman confessed a moment of pity which nearly disarmed him, but his devotion returned. He gloried in the thwarted assassination, not because he had not earned a murder charge, but because he revenged the cause of labor. His fanatical devotion put him at odds even with Emma. She had countered regarding their partnership: "I did not believe that a Cause which stood for a beautiful ideal, for anarchism, for release and freedom from conventions and prejudice, should demand denial of life and joy." She danced, flirted, easily won over wooers, and fired up the crowds with a natural gift for oratory. Short, fat, unprepossessing, but once she spoke, she ignited her audiences. This talent worked against her: promotion of an unpopular cause found the pair and their comrades reviled; the first American war on domestic terror erupted. The Avriches observe: "A populist at heart, Sasha fought to apply Russian solutions to American problems." His love of the gun and his Nihilist and Autonomist bent left him an outcast in his adopted land. After he tried to represent himself in court in a typically headstrong fashion, he went to the Federal penitentiary for more charges than his admittedly brutal case merited, a sentence of 22 years. He was 21. While Sasha learned from the savagery in his Pennsylvania cell the necessity for prison reform, as his later-published memoirs presented an eloquent and expert testimony for such progress, Emma had to survive. She was hated by many. Odd jobs and a year or so underground as "E.G. Smith" proved her fate after President McKinley's unhinged assassin claimed he "was a disciple of Emma Goldman". Berkman stayed true to his habits. He masterminded a plot, after the Ludlow, Colorado, massacre of striking miners, to kill John D. Rockefeller, Jr. in 1914. He did not involve himself directly. His conspirators in Manhattan failed to get close enough to their target, so they took their bomb back to their Lexington Avenue apartment. There, in proximity with stored dynamite, it exploded; three of the anarchists died, twenty residents in the building were injured. The casualties would have been higher if it were not a holiday finding many occupants on the streets already, for the Fourth of July. An urn with ashes from the three at their funeral "formed the shape of a pyramid symbolic of the class system, with a clenched fist bursting from the apex." Such details enliven this book. While dense in its accounts of where the globetrotting pair roamed and whose paths they crossed, the narrative moves steadily and downplays even the inevitable ideological feuds and rivalries endemic to any political movement, favoring a careful, objective relating of the pair's actions and writings. To protest the militarization celebrated at a 1916 Preparedness Parade in San Francisco, Italian anarchists planted another device. Ten spectators died; forty were wounded. The blame fell instead on local labor organizers and agitators. Tom Mooney and Warren Billings were sentenced, as were the McNamara brothers in Los Angeles a few years earlier, in a climate markedly anti-union and pro-business, supported by a vindictive judiciary, corrupt police,grandstanding politicians and sensationalist media. The relevance of such episodes within this study needs no elaboration. Sasha was not involved, but his determination to defend Mooney led to his indictment. He opposed the draft, so this led the Federal government to apply wartime legislation. This called for his deportation as a disloyal Russian national and his exile, along with Emma and other anarchists, many of whom had emigrated from what was bursting into the Soviet Union there, which fired up the first Red Scare here. On trial in 1917, Berkman challenged the court: "Are you going to suppress free speech and liberty in this country, and still pretend that you love liberty so much that you will fight for it five thousand miles away?" Goldman followed in her final statement: "Our patriotism is that of the man who loves a woman with open eyes. He is enchanted by her beauty, yet he sees her faults." This time Sasha (and Emma) had a competent lawyer, but the jury took thirty-nine minutes to return a verdict of guilty. After serving time in America, the pair were sent off along with other foreign-born anarchists and Communists to the USSR at the end of 1919. Emma was fifty and Sasha about a year younger. J. Edgar Hoover claimed personal credit for their expulsion. Her private letters, he confided, made for "spicy reading". Bolshevik oppression of their own party, not to mention socialists and anarchists, almost immediately disheartened the pair. Lenin summoned Berkman and Goldman to serve their new state by forming a mutual friendship society with America; the couple had resisted assisting the Soviets directly. The Kronstadt rebellion and its savage suppression showed how thousands rather than a handful might be slaughtered by a power who bested that of capitalists in his cynical bloodshed. A chance for Emma to attend an anarchist convention in Berlin offered a chance to escape. The year 1922 opened with the pair fleeing to Stockholm, then Berlin and Paris. Emma wound up in London while Sasha remained in Germany. By now, both rushed to assist the victims of Communist rule along with getting their accounts into print, if in botched form by the publishers. These books reported for the first time the truth about the aftermath of the Russian Revolution. But many purported progressives refused to believe. Leftists hurried to dismiss the pair as traitors, while more moderate readers remembered Berkman and Goldman's strident defenses of violence in the name of an anarchist ideal equally suspect by the majority. Neither book sold very well. However, H.L. Mencken praised them, and intellectuals tended in Britain and on the Continent to regard Emma and Sasha with more sympathy and indulgence for what they had endured in the US and the USSR. Both found love separately, and both wound up in the South of France. A paper marriage allowed Emma to travel on a British passport. A campaign by her friends to Frances Perkins, Secretary of Labor under F.D.R., enabled Emma to return to the America she missed, if for three weeks in 1934. She managed on her visit, in her mid-sixties, to enter a tumultuous affair with a scholar of anarchism at the University of Chicago. A married man and a father, blind since four months old, he was then in his mid-thirties. In the '30s, Berkman chose to settle in Nice and Goldman in St. Tropez. Sasha had fallen for a tempestuous girl in her early 20s who proved difficult. Emma enjoyed her modest villa and visited the syndicalists and anarchists fighting for the Spanish government against fascism. Both authors warned, long before that decade had darkened, how Communism led to fascism, two sides of corporate control and authoritarian imposition upon the individual, whose freedom anarchism proclaimed. Worn out by poverty, extreme pain, and the effects of poor nutrition and incarceration for so long, Berkman suffered from depression. He took his life in 1936, but as with his attempt on Frick, his shots missed the fatal mark, and he died in agony after the fact. Forty-four years after his first use of the pistol, he had fumbled the final action again. Goldman lasted four more years. After lobbying in Toronto to raise funds for refugees from the Spanish Civil War and the defeat of her allies, she succumbed to a second stroke. Both are buried in Chicago's Waldheim Cemetery, near the graves of Haymarket anarchists who first inspired the pair. This biography, the first to fully interweave their restless lives over six decades of agitation, education, and organization (if voluntary rather than coerced), results in a solid presentation. Paul Avrich gathered this material efficiently. Karen Avrich arranges the research into an objective, yet accessible and direct, prose style. The authors present the lives of two passionate, outspoken agitators in a calm, considered tone. Endnotes list sources (a full index but no separate works cited) for those eager to follow the journey, ideologically and geographically, of this wide-ranging Russian couple. Although Sasha and Emma worked better as partners rather than lovers, their contributions to the history of political upheaval and social change resonate. A few blocks from the sites of anarchist protests and rallies, Occupy Wall Street rose up a hundred years later, as a similar struggle continues.